Motto: Fuimis - We have been. Our family ties to Robert I, King of Scotland: Belinda B. Nash, my GGGG Grandmother, had a sister, Mary B. "Polly" Nash (GGGG Aunt), who married Squire Bates - the 16Great Grandson of Robert the Bruce. The background you see is the tartan that belongs to the Bruce Clan. It is called Bruce 2. 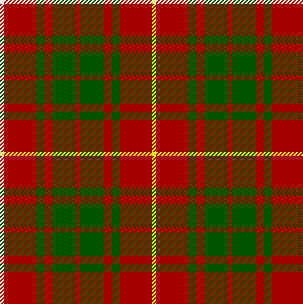 There are five other Bruce Tartans of which you can see below. On mouseover the name of each tartan can be read. The claimed progenitor of this clan is Sir Robert de Brus, or Bruis, a Norman knight who accompanied William the Conqueror to England in 1066. His 11th century family seat, The Chateau d'Adam, not far from Cherbourg still survives. Although he is thought to have died soon after his arrival his son acquired great lands in Surrey and Dourest. His son Robert El Meschin (the cadet) was companion at arms to Prince David, later David I, during his stay at the court of Henry I of England. Brus received from David a grant of the Lordship of Annandale. This charter, though not dated but probably granted about 1125, still exists. He resigned his lands to his son at the outbreak of war with England, and at the Battle of the Standard in 1138, the elder Brus, who fought on the English side, is said to have taken his own son prisoner. Robert, Fourth Lord of Annandale, married Isobel a niece of William I, The Lion, who brought to the marriage extensive estates in both Scotland and England. 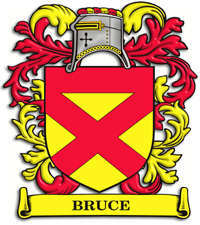 It was on this marriage that the subsequent claims of the family of Bruce to the throne of Scotland were based. Robert, Sixth Lord of Annandale and First Earl of Carrick, maintained his claims, but fought on the English side at the Battle of Dunbar in 1296. He died in 1304. His eldest son Robert, Seventh Lord of Annandale and Second Earl of Carrick, was born in 1274. He was the famous Robert the Bruce, victor of Bannockburn in 1314, who after a fierce struggle gained Scotland's independence from England. This was acknowledged by the Treaty of Northampton in 1328. Robert I died in 1329 at Cardross in Dunbartonshire. His body was buried in Dunfermline and his heart in Melrose Abbey. In 1370 the first Stewart monarch succeeded to the throne by right of descent from Marjorie, Bruce's daughter. Sir William Wallace made a name for himself as a waring rebel who tried to unite Scotland and make it a free land and out of the control of its English neighbors. In 1297 he defeated the English and killed the sheriff of Lanark. He then went on, building his army until it faced and crushed the English forces of the Earl of Surrey at Stirling Bridge. Killing one of his arch rivals, Treasurer Cressingham, his undefeated army celebrated their victory by cutting the flesh of Treasurer Cressingham into pieces and handed them out as a symbolic gesture. Sir Wallace made a belt out of his piece. The King of England, Edward 'Longshanks' I, had had enough and made his way to Scotland with a powerful army to defeat Wallace and his men in the town of Falkirk in 1298. At one time Robert the Bruce stood next to Wallace proclaiming to the people that he, as royalty, would stand with them in battle to fight for his country. He later changed his mind and decided that the odds were with the English, and so joined ranks with them. Wallace, after being defeated, made for foreign lands to try and gain support for his cause, but on his return to Scotland in 1305, he was captured by the governing English in Glasgow and was taken to London. Convicted as a criminal of the state he was sentenced to death and promptly hung by the neck. As if that weren't bad enough, while still alive he was disemboweled, his head cut off and his body cut into quarters. 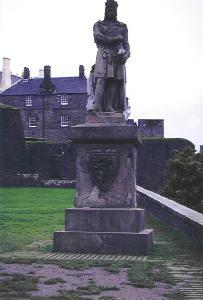 Robert watched while Wallace's head was displayed high on London Bridge and the four quarters of his body taken to Newcastle, Berwick, Perth and Stirling for display there. Edward I had to wonder if he had done the right thing, or had he created his worst nightmare - a martyr that the Scots could cherish forever! Robert the Bruce, now began to rethink his affairs. At this time he was regarded as a turncoat and murderous traitor by the Scots people, but he was soon to atone for his past decisions and become a greater hero to his kinfolk than Wallace was. During the next few years - like he had done in the past - he made peace with the English and then broke it again, and so on and so on. It wasn't until 1304 that he began to show signs of where his heart was, and he made a treaty with the kirk (the church) that would help his attempt at the throne of Scotland. Robert the Bruce knew that with religion behind him he was more likely to win the support of the people. Time passed and by the end of 1305 he was a natural leader and made his plans for the throne of Scotland clear. A meeting with John 'The Red' Comyn at Greyfriars church in Dumfries marked the last obstacle in his path, and during the argument they were having Robert stabbed John to death. Seizing his chance he then moved on to Scone where he claimed the throne and was crowned King Robert I of Scotland, and was given the traditional blessing from Countess Isabel of the MacDuffs. The Scottish people gathered around their new king and looked to him now for their freedom. After a number of battles, some successful and others not, it is at this point that the legend of Robert the Bruce is best known. After a bloody defeat, and while taking refuge in a dark cave escaping the English army, Robert sat and pondered his campaign. Feeling the power of failure he looked up and saw a small spider climbing up its silken thread to reach its web, time and time again the spider fell, but returned again to struggle its way home. As you might have guessed, the influence that this imagery had on Robert lead him to pick up his sword and exclaim "If at first you don't succeed - try, try again!". His words remain with us all still. And that is indeed what he went out and did. Regaining strength he punched his way forward defeating the English in his stride. Edward I had died, and his son Edward II took his place and decided that Robert the Bruce had to be stopped. With an army more than twice that of King Robert's, Edward marched to Scotland and faced Bruce at Bannockburn. A mighty battle was fought and Edward's army was defeated. The battle of Bannockburn remains as one of Scotlands greatest victories, and at Bannockburn the flower of England was crushed and the flower of Scotland was victorious. Scots still remember the victory in the National Anthem (although unrecognised) called 'The Flower of Scotland'. Robert the Bruce was now marking himself in history as a hero to his people. But he hadn't finished there. The victory at Bannockburn did not end the fighting, but it cast rumours among the opposing English that an army of half the size of Edwards had won - it gave Bruce the upper hand. Finally the wars were over and he had managed to achieve what was thought impossible - freedom for Scotland. The Edinburgh-Northampton treaty was formed and signed in 1328 giving King Robert the Bruce his greatest victory - complete rule of Scotland as an independent country, with no subjections. Now known throughout the land as 'Good King Robert' he further made a treaty with the Pope known as the 'Declaration of Arbroath' and this still stands as the most remarkable statement of nationalism in medieval history. The support of the Pope to the Scottish cause. For a while King Robert I named his brother Edward as heir, but he was killed (1318) in Ireland trying to claim the Irish throne before he could claim the title. The succesion was handed to the family of Robert's daughter, Marjory, who had married Walter Steward. However, in 1324 the king finally fathered a legitimate son, the future David II. Now at peace with England, reconciled by the Pope, master of an ordered realm and with the succession now secured, on June 7th 1329 Robert the Bruce of Scotland died of leprosy and his heart was cut out and taken on a crusade as a final gesture to God that he wanted to atone for the sins of his youth. He didn't need forgiveness from Scotland - they had forgiven him a long time before. So Robert the Bruce - King of Scotland had achieved the dreams of Wallace. Although Wallace is still the true patriot who never once wandered from his devotion to his homeland, Robert the Bruce, after some wandering and indecision about his loyalty, was the one who gained Scotland its freedom.